A popular Saturday afternoon activity at The Peninsula is our Reminiscing Group. Our residents look forward to these group discussions which offer an opportunity to talk about their past and learn about others. Reminiscing is a great way to recall positive memories from the past. Seniors may feel isolated from their identity as they age. Being able to relive and relate their life stories gives residents a sense of self-worth and enhances self-esteem. Our staff also enjoys these afternoons to learn more about our residents. When your loved one says they went to a Reminiscing Group you’ll understand its value. The Reminiscing Group also offers the camaraderie of others. It’s always worthwhile when seniors can talk with others who are part of their generation. Their memories may be different but there’s a common thread in life experiences. Studies suggest that seniors who are encouraged to share events from their lives with others experience an increased sense of peace and self-worth. 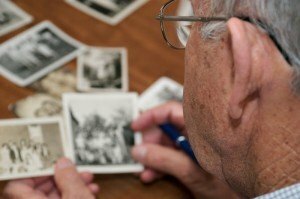 Reminiscing can be an important tool for socialization. Think about what happens when you first make a friend: you spend much time “filling each other in” on your life history—who you are and have been, where you have lived, who is important in your life. You want to find commonality. People find it very satisfying when they learn if someone grew up in a town near theirs or is from the same geographic area. Before long they’ll learn they both when to the same high school and other amazing commonalities. Also, reminiscing, the process of life review, is an important part of aging. As seniors recall their accomplishments and come to terms with conflicts and disappointments, they achieve a heightened sense of personal identity and meaning in life. Heard a story again? Don’t worry. When a senior repeats stories, family members and friends need to understand this is a beneficial part of the life review process. It’s vital to be a good listener. Older adults offer a wealth of stored experiences and love an interested listener.